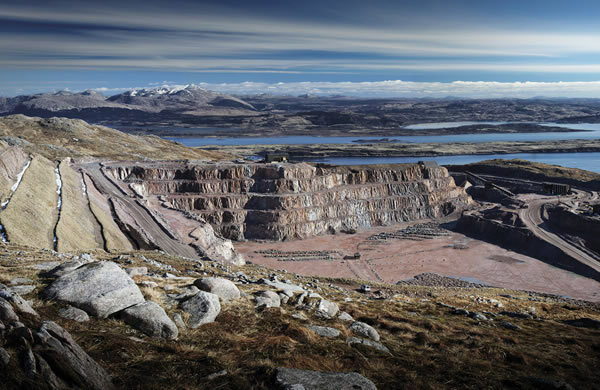 This month, Aggregate Industries is celebrating 30 years of shipping from its super quarry Glensanda, which can be found on the mountainous West Coast of Scotland. Glensanda is the largest established granite quarry in Europe, with export links across the whole of the continent. Boasting an annual production capacity in excess of 9 million tonnes, the site has 760 million tonnes reserve of granite. The site was first discovered in the 1970s by John Yeoman, whilst on a boating holiday. Situated on the banks of Lock Linnhe, Glensanda is surrounded by mountainous terrain, making it accessible by sea only. After its discovery, it was named as a potential location to identify coastal super quarries, in a report commissioned by the government. Extraction began in 1986; on 5th August that year, the first shipment of granite left the quarry, arriving in Texas 10 days later. Since then, more than 5,500 shipments have been made to projects across Europe. The Channel Tunnel, for instance, has benefited from Glensanda granite, as well as Amsterdam’s Schipol airport, Hamburg’s Moorburg Powerstation and the TGV rail line from Bordeaux to Bayonne. Glensanda is renowned for being one of Earth’s most efficient mineral extraction operations: granite is crushed at the top of the mountain and fed into a hole; the rock is taken down into the core of the mountain and through a horizontal tunnel of 1.8km, which leads to the foreshore. There, the rock is washed, screened and stored for ship loading. With its own fleet of purpose-built ships, the site is able to transport products directly from its harbour to its customers in the deep water ports around the UK and Northern Europe. 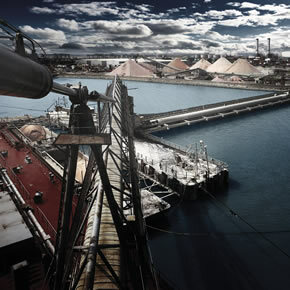 Its ships are capable of transporting almost 100,000 tonnes of granite from quarry to market. As one of the world’s largest single quarry operations, Glensanda accounts for almost 100% of all aggregate exported from Britain. Over the years, Aggregate Industries has invested millions of pounds into the site, which enables it to produce unique products and tailor its services. Most recently, it has delivered a new crusher and implemented a new delivery system to keep operations running smoothly.